What’s playin’ at the Roxy? 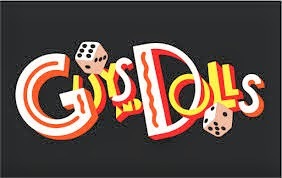 A tight, well rehearsed, energetic and thoroughly entertaining production of "Guys and Dolls." First time director John Farrell and seasoned music director George Garber Jr. work well together. The casting choices, including a few bold ones, serve this production admirably. Farrell’s objective to keep it simple, using projections along with a few easy to move set pieces, keeps the scene changes short and the action flowing. Garber leads a 10-piece band through the score by Frank Loesser with deft precision and an ear for detail that sets a very high bar for a community theatre produced musical. The instruments and voices blend so well that the balance rivals that of a recording, and all of this at a very comfortable volume. The members of the ensemble cast work together like the proverbial well-tuned and oiled machine; a machine with some mad vocal skills as well. Soloists and chorus alike bring some lovely voices to the party. Stand out performances from supporting roles come from Pat McMahon as Nicely Nicely Johnson; his timing and physical comedic ability are quite entertaining. Paired with Jay Torres as Benny, the two elicit belly laughs galore from the receptive opening night audience. Rick Buzzee contributes a wonderful, grounded performance as Arvide; his solo “More I Cannot Wish You” is a wonderful moment. Lead performers Tom LeCourt as Nathan, Martina Haskins as Adelaide, Carl Schwarzenbach as Sky and Lyndsey Ryder as Sarah, all work very well together. LeCourt is not subtle in his portrayal of Nathan, creating some hilarious moments. Schwarzenbach's Sky is a bit more subdued, adding a contrast between the two inveterate gamblers. The chemistry between Schwarzebach’s Sky and Ryders’ Sarah is obvious. A bit more range of emotion from the Sarah character would be welcome, especially in the duet with Adelaide. Kudos to cast and crew for putting together a polished and enjoyable show.